The greatest challenge in advertisement is that content always has to be new, surprising and, above all, unique. Those who produce meticulously tailored, involving and relevant conversation and content and thus match the interest of the target group are among the front runners. This corporate film is about the presentation of an analogue content machine installed in a special room. The machine, it is claimed, can produce creative content continuously by ideally combining aspects of attention, emotion and relevance. The plot, cuts and sound of the film itself conform perfectly to the integrity and professionality expected of such a film. Yet the content, which is delivered by actor Jacques Palminger with seriousness and pathos, does not really fit. 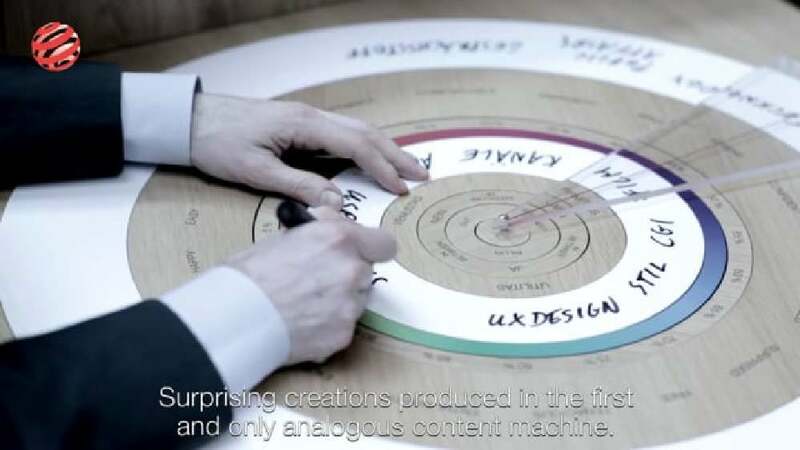 The machine, which is based on the principle of a disc calculator and claims to be able to make visible ever new connections and chains of association thanks to turnable rings, is actually nonsense – yet the message reads: while others are still debating creative content, this agency is already producing it. This image film is outstanding in that it successfully makes viewers buy into the fake seriousness of the story it tells by keeping up the strange plot and atmosphere with utmost consistency. Surprising and avantgarde in concept, everything ranging from sound and set-up to the choice of actors is perfectly matched, so that the self-irony can unfold to the fullest.